A short disclaimer before I start this post. This is the Morphe 600 12 Piece Sable Brush Set. This means that the brush hairs are made from sable & goat hair bristles. I did a post not too long ago about animal cruelty/being vegan etc. However, these brushes are a cruelty free collection so I don’t have an issue with buying them since I’m not a vegan myself. So just be wary if you are or have a problem with animal hair bristles! Anyway, lets get onto what brushes you get in this set & what I think of them! Brow Groomer – I’ve always used a brow groomer to brush out my eyebrows and this is pretty standard. Nothing too special! Spoolie Brush – I’m so pleased I finally have a spoolie brush, I’m now using this to brush out and groom my eyebrows apposed to the brow groomer. Flocked Sponge Brush – The classic applicator for eyeshadow, one that I’m not a fan of. I’m sure I won’t be using this at all, because I tend to use various brushes to do my eye makeup. Angled Liner Brush – I swear I never use brushes for their original function, but I love using this for filling in my brows. Its just the right size and you can be really precise with this one. Pointed Liner Brush – Another brush I probably won’t use but I’m willing to give it a try at some point (no pun intended haha). This is meant to be great for applying gel liner with. Soft Fan Brush – This is probably the main reason I bought this set to be honest. I’ve been on the hunt for a decent fan brush for ages. I love me some highlighter and I know using a fan brush makes it look even better. This is so super soft and does a great job at applying highlight. Smudger Brush – I love using this little brush to apply eyeshadow beneath the eye, just under my waterline. Super practical! 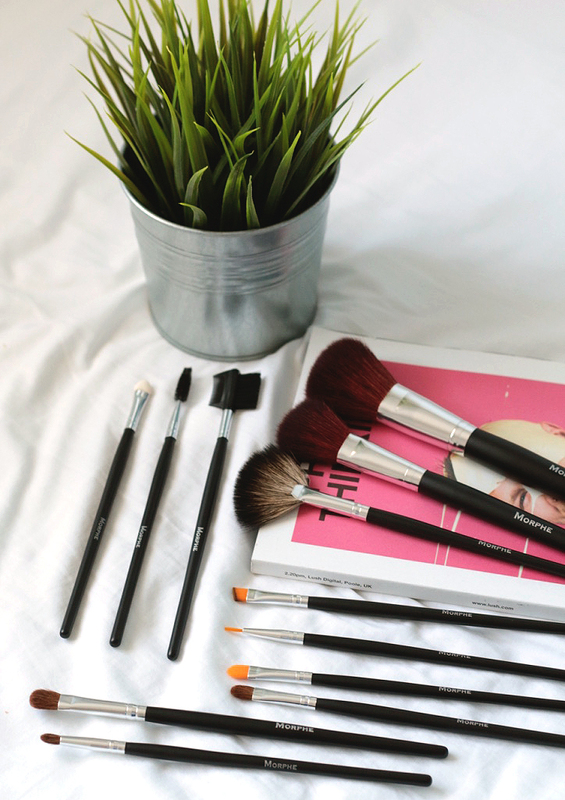 Chisel Fluff Brush – Classed as a multi tasking eyeshadow brush and I couldn’t agree more. Again this is so soft and perfect for packing on shadow, blending out etc. Oval Fluff Brush – A super fluffy/soft blending brush, I’ve been loving this! Maybe even more so than my beloved Sigma blending brush! Oval Lip Brush – I personally never use lip brushes, but if you’re really into makeup or a makeup artist I feel like this is a great brush to have in your collection! Tapered Blush Brush – Again, extremely soft blush brush! I’ve also been using this to bronze my face, and it works really well with that. Tapered Powder Brush – The biggest brush of the bunch, but I don’t own a powder brush so this is perfect. Also super duper soft, so I’m happy! Overall I really like this brush set and for only £11.25 you can’t go wrong. Its got some great staple brushes that can be used on a daily basis. And for the price, they’re really amazing quality. I’d recommend!